Shoulder dislocation results when the top of the arm bone, the humerus, detaches from the shoulder blade, or the scapula. Like others who suffer from frequent shoulder dislocations, you may develop the habit of self-repositioning. We highly recommend you pay us a visit to ensure proper placement. Your orthopedic doctor can generally reposition the arm without anesthesia if the problem is treated quickly after the incident. Once the area has been repositioned, the doctor may send you home with a mobilizer sling and prescribe anti-inflammatory medication. 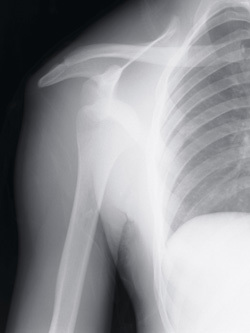 To prevent further dislocations arthroscopic surgery is sometimes required to stabilize the capsule of the shoulder. Why is the Shoulder Unstable? Our shoulders are the most movable joint in our bodies. However, this joint is not stable simply because of its large range of motion. It is easily injured because the ball of the upper arm is larger than the shoulder socket that holds it. To remain stable, the shoulder is anchored by its muscles, tendons, and ligaments. Disruption of soft tissues as a result of injury, overuse or underuse of the shoulder cause problems. Another problems is the degenerative process in which tissues break down and no longer function well. Shoulder pain may be localized or may be referred to areas around the shoulder or down the arm. Pain felt in the shoulder blade or scapula regions nearly always originate in the neck.